I chose BTI bubble dosimeters for sensitive, whole-body dose-equivalent response to the pulsed fast neutron field expected around this RFQ. We use our BTI dosimeters as both temporary area monitors and personnel monitors. In the interests of safety, we conducted this evening’s full test of our RFQ at only 0.83% duty (a 100 μs beam pulse at 83.33 Hz) and increased the RF accelerating field to design strength very carefully, taking neutron dose measurements along the way. We accelerated only 6 mA of beam. Results are shown in the photo at left and this video (AVI format, 6.5 MB). 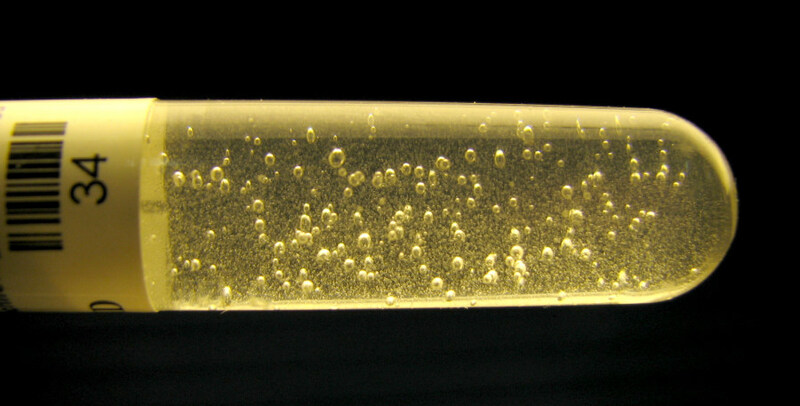 The photo shows 213 bubbles collected at the surface of the Faraday cup in 11 minutes. This is 19.4 bubbles / minute, or 34 mrem / hour for this particular dosimeter. What if we ran a continuous 6 mA beam instead of 0.83% duty pulsed beam? We’d have measured 4.1 rem / hour at the cup from neutrons, definitely not a negligible hazard. In the video, we see about 30 bubbles accumulate in a detector held by hand against the Faraday cup for one minute (and the bubble dosimeter in the photo can also be seen taped to the Faraday cup). Here’s a tip for Windows users that have trouble viewing your avi… try “VLC Media Player”…. worked for me. Carl, fascinating to see those bubbles pop. With all those neutrons, were there no dangerous x-rays?